Prideaux John Selby, the son of a wealthy landowner, was well educated and led a privileged life. As a boy he had much time to devote to the study of plant and animal life, and pursued his interests as a naturalist and artist. Educated at Oxford, Selby was to become a gentleman naturalist, with a passion for natural history and ornithology, whose superb abilities as an artist and scholar resulted in him becoming a central figure in the British scientific community of the early 19th Century. Selby spent countless hours studying birds in their natural habitat, making careful notes of their every movement, and later using this information to create his beautiful life sized colored drawings. Selby was a highly skilled etcher who etched his drawings on copper plates, and used Lizars’ engravers and colorists for the finishing and printing of the plates. The result, Selby’s “Illustrations of British Ornithology”, was what is considered to be the English equivalent of “Audubon’s Birds”, with Selby’s etchings ranking with Audubon and Gould’s works as some of the finest bird prints ever produced. 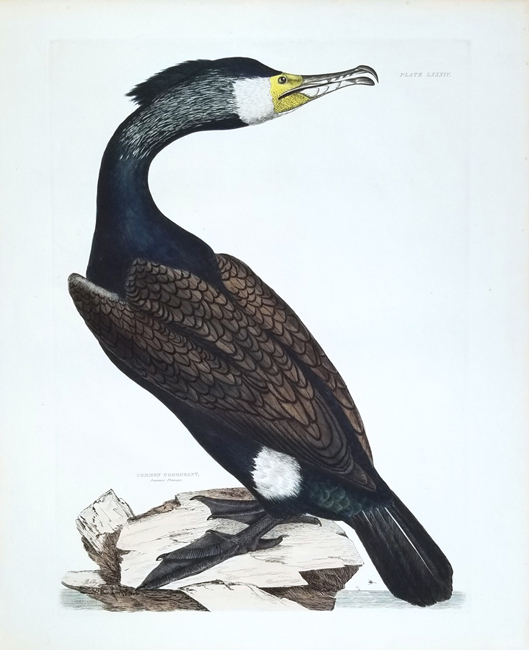 Selby’s is the only work, other than Audubon’s, to depict every bird in it’s actual size, and consequently is the largest bird folio other than Audubon’s. His “Illustrations of British Ornithology” was originally issued as a series by subscription in 19 parts from 1824-1834, and consisted of 89 plates of land birds and 129 plates of water birds. Prints from this publication are very rare and feature exquisite original hand coloring.